Supreme Window & Glass has provided custom glass cutting and mirror applications to homebuilders and homeowners in Cleveland since 1960. Whether for a standard size vanity, a custom-size window or an entirely new space, we specialize in creating mirrors and glass to complement your decorating style. 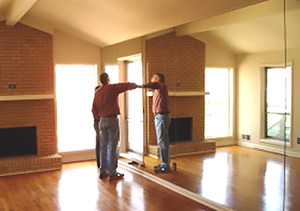 Make areas of your home or business appear larger – by simply reflecting more natural light. To further customize and provide a one-of-a-kind piece, we can bevel the edges, provide a variety of finishes (smooth, gloss and frost), and add arched tops, patterns and designs. Our cutters take pride in their work and ensure only the highest quality of product available.